The barn owl is unsurpassed for its willingness to bring wild unbridled nature to our very doorsteps. And, being a species of open fields, it can be attracted to rural yards across much of the United States. The one requirement for attracting barn owls is adequate vole habitat such as meadows, pasture, and hay fields. Dairy farming areas generally have an abundance of barn owls. However, grain belt states where nearly 100% of the land is in row crops have seen a precipitous decline in barn owl populations. If adequate open vole habitat exists within 1 mile of your home, your yard is a potential candidate for a barn owl nest site. The one-time effort of constructing a nest box is all that is required. While much evidence exists that barn owls prefer nest boxes to various natural nest sites, it is unclear how important nest boxes are to maintaining populations of this species. It is likely that many natural nest sites go undetected, thus biasing data that seems to indicate that the barn owl requires nest boxes or other man made structures. Even so, nest boxes offer greater safety from predators and daytime mobbing by crows, jays, and other species. But, the greatest value of offering a nestbox is having this fascinating nocturnal predator rearing young right in your back yard. A chimney of our house had been a traditional barn owl nest site long before we moved here. Young were successfully reared 6 of the 7 years we had lived here, until 1993. In that spring, Diane noticed 3 adult owls on the chimney, flapping about in an obvious disagreement over something. At that time nesting had already begun in one of the chimney flues. Three eggs were present in a flue that had not previously been used. The morning after this altercation, I climbed up on the roof to check the nest and found the three eggs strewn around and broken open. It is unlikely that a raccoon or other predator destroyed the nest without eating the eggs. 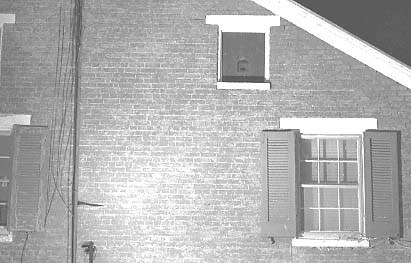 No further nesting attempt was made in the chimney that year, suggesting that a pair of owls nesting nearby drove off our pair in defense of nesting territory. Concerned that the chimney site would be permanently deserted, I built a nestbox in an attic window directly below the chimney. 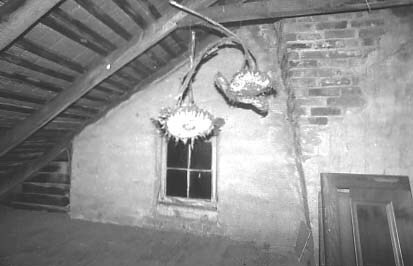 In 1994, the nestbox was readily accepted and five eggs were laid. This smaller than average clutch was likely due to the record severe winter of 93/94. Barn owls lay fewer eggs after hard winters and when prey is scarce. Prior to laying the first egg, the owls began to cache food in the box, first one vole, then several, and on one morning, 7 voles were found. When the first egg was laid and the female began to incubate, the nest was not monitored except for checking through a narrow crack between boards to be sure she was still there. The nestbox was placed in a southeast facing window to protect the entrance from the westerly winds, which would blow rain onto the nestlings. However, when hot weather came in May, this west breeze caused very hot air in the tin roofed attic to continually flow into the box and out the entrance hole, raising the temperature in the box to that of the attic. The first hot days seemed not to affect the 4 to 10 day old nestlings, but twelve days later, a second hot spell caused a great deal of distress to the older and much larger nestlings. This distress was obvious on the video monitor and each of the young actually lost weight that day. A small exhaust fan was fitted to the box lid to draw in outside air through the entrance hole. The owls immediately perked up and no other problems were experienced during the nestling phase. The fan was operated on a thermostat set at 90 degrees F. until the young fledged. Overheating may be a common, but, overlooked problem in many nest boxes and attic or loft nest sites. Even though our attic has cross ventilation, the temperature at nestbox level reached 110 degrees F. when the outside temperature was in the mid 80's. At the attic peak, the temperature was even higher. A nestbox should not be built near the peak of a metal roofed shed and any site in a building loft should be monitored for excessive heat before offered as a nest site. An easy way to do this is to place a min/max thermometer at the site and check it after a hot sunny day. Large areas, like barn hay lofts are not as likely to build up heat. Barn owls frequently use abandoned concrete silos as nest sites, perhaps because they are cooler than wooden structures. If the metal roof is missing, an enclosed box should be mounted on or near the top of the silo. Otherwise, a platform can be mounted under the roof. The small brood of 5 in our attic nest box combined with good hunting weather and plenty of voles led to a productive and uneventful nesting. The smaller brood size also meant that there was not a great age difference between the youngest and oldest sibling. The oldest owlet in the brood was 7 days older than the youngest. While this age difference appears quite dramatic, there can be a difference of two weeks in larger clutches. Until the oldest owlets were quite large, there were always voles left over from the night before to be eaten during the day. Even during feeding visits, the owls remained quite calm and waited their turn to be presented with a meal, unlike the young of most songbirds. Perhaps this great civility toward their siblings is necessary to avoid maiming one another. Even before the young develop feathers, they have huge legs ending in formidable talons, not to mention a sharp beak. Almost 100% of the prey observed on the video tape and during nest checks were meadow voles, except for one period when, to my surprise and pleasure, fledgling starlings suddenly were brought in great numbers. First a partially eaten starling appeared in the nest box, then two more were brought to the nest while the videotape was running, and, four decapitated starlings were found on the ground directly under the nestbox entrance. Although I haven't yet dissected the pellets from this nesting, previous nestings pellets contained no more than 2% avian remains. The reason for the sudden interest in starlings was that several families of starlings had recently fledged from nests in the old sycamore trees in our yard where the owls frequently perched to pass food and rest when not hunting. So many inexperienced fledgling starlings roosting beside them were simply too good to pass up, even though not much except the heads were eaten. However, barn owls will not be a problem to songbirds in your yard. In fact, they never actually hunt in our yard. Their hunting technique is confined to swooping over open grassland much as the harrier does by day, catching voles and mice on the fly. They will not be inspecting shrubs and trees for roosting songbirds or their nests. Nestbox feeding visits were monitored using an infrared beam and chart recorder until the older nestlings began to lean far out of the entrance hole and block the beam. Nestlings were weighed each night at midnight until they reached 350 grams (the limit of the triple beam balance used). Individual nestling weights fluctuated somewhat according to the length of time after a meal, especially since the owls were weighed well after the evening feeding visits had begun. However, daytime weighings would have caused the brooding female to flush and probably not return until dark. After each midnight weighing, an adult returned within five minutes after the attic light was turned off. A video camera was used on several nights to monitor the activity of the young as well as the feeding visits of the parents. A 7 watt light bulb was used at reduced voltage to provide just enough light for videotaping. The adults seemed unaffected by this dim light. Observing nestbox activity can be extremely time consuming and usually requires the use of a blind at the nest. However, home video cameras have eliminated both of these problems. A cable was run from the camera in the attic to a monitor and vcr in my office. The monitor was placed beside the computer where I could keep an eye on the owl's activity while working. The tape provided a complete record to be viewed later. The chart recorder also sounded an alarm whenever the uv beam was broken by a returning adult. This procedure has also been used on a barn swallow nest and will be used with our resident kestrels. The silent video camera is much less intrusive than a human staring through a peep hole or one way glass. Until the youngest owl was old enough to compete at the entrance hole, the female would enter the box and select which owl to feed. She didn't appear to be taking any sort of cue from the young, who all became still when she entered. During both day and night, the owlets spent a great deal of time preening their newly emerging feathers. Sometimes one would begin to preen a sibling, but, only for 2 or 3 seconds. They also found it necessary to occasionally stretch their wings, usually just one wing at a time, due to the limited space available. This would always lead to a nearby sibling being brushed by the wing and toppling over. It took some effort for the owlet to get back on its feet, apparently because of the weight of its huge head. But most of the nestlings time seemed to be spent simply waiting and growing. It was only their last few days in the nest when they began to actually do things like approach the entrance and look outside or flap their wings or hop and grab with their talons as if catching an imaginary mouse. FLEDGING - The adventure begins! The first two owls fledged on the same night. One of them apparently flew from the nestbox directly into a power line 50 feet away. It was found dead the next morning directly under the wire with no marks except an inconspicuous one on the top of its head. The wires were separated by over three feet, so it could not have been electrocuted. All four remaining fledglings were continually and unbelievably loudly begging for food in the sycamores in our front yard each night, as each generation before them had done. They sometimes perched within ten feet of our upstairs bedroom windows, making this the least lovable phase of the owl rearing process. Once each night I would shine a flashlight up into the sycamores and count the fledglings. They could also be counted by standing under the trees and listening to their calls, since there were only four of them. After midnight, one night, we noticed that the owls were not calling at all. If they had moved out of the sycamores and down to the fence row, we would have heard them, and, they were still too young to be driven off by the adults. The next day, just after sunset, a great horned owl was seen perching on the wood shed, facing toward the house. One of our horned owl pair is frequently spotted along the creek or heard at a distance, but never seen perched in the yard. I continued to watch from the barn and the owl seemed content to stay where he was, not looking down for rodents, but, simply waiting. I went back to my office in the barn, leaving the owl to whatever business he was about, and, didn't emerge again until after midnight. The barn owl young would now always fly away when I entered the front yard with a flashlight, and always fly in the same direction, toward the fence row trees, making it easy to count them in the air. There were only two and they didn't make a sound. These two fledglings continued to return to the sycamores for a couple weeks to be fed by the adults, but they never again called for food. Even the adults were quiet, compared to previous years. It is likely that the two missing owls were eaten by the great horned and the two remaining owls learned a valuable lesson about living in great horned territory - be quiet and stay put. The great horned owl is an amazing predator, eating everything from mice to skunks. But, more amazing is the great effort that went into growing a single 400 gram snack of barn owl meat and bone in about eight weeks. The patient incubating, the brooding, nightly weighings, the videos, the hundreds of voles brought to the box by the relentless hunting of the adults - all this for a single meal! And elsewhere, rabbits, skunks, crows, squirrels and opossums were all doing the same thing - busily and dutifully growing more snacks for the great horned owl. It is likely that most prey taken in the summer are the young and inexperienced of any species. The young that are eaten serve as important a purpose in nature as those that survive. Without a surplus of inexperienced young prey, predators would be hard pressed to feed their own young. The two barn owls who survived are not likely to suffer the same fate as their siblings, having learned from the experience. However their survival will depend on their each finding an unoccupied habitat and surviving their first winter. Barn owls face tremendous odds and their species is known for booms and busts. Severe winters can cause the local population to crash, but when conditions are right, large broods can cause the population to rebound rapidly. It is only loss of habitat that prevents such rapid recoveries after weather related crashes. &COPY; 1991, 1995, American Artifacts and Richard Van Vleck, Taneytown, Maryland.